Click on this link if you need more information about Industrial Heaters. 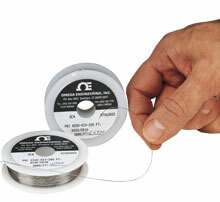 OMEGA™ NIC80 nickel chromium wire is a resistance heating wire comprised of 80% Nickel and 20% Chromium. NIC80 wire is commonly used for heating at elevated temperatures. NI/CR-80/20 is essential for resistive elements in high temperature applications such as electric furnaces, electric ranges and radiant heaters operating at temperatures up to 1150°C. * Showing approximate amperes necessary to produce a given temperature, applying only to a straight wire stretched horizontally in free air. Nota: This wire is not intended for use in making thermocouple elements.